Writing the same blurb of text over and over? You can customize Vocus.io to automatically expand a keyword to a long blurb of text. Great when you find yourself repeating the same emails, such as introductions, thankyous, signatures, product pitches, or common Q&As. You can customize snippets from the Dashboard > Snippets screen. Don't touch that trackpad. To lookup your current snippets, type a forward-slash '/' followed by part of the name of your snippet. Hit enter and it will immediate insert that perfect piece of text. You can customize the trigger key ("/") to any other character, such as: #, @, !, etc. A slash-command can do a lot more than just insert a piece of text. 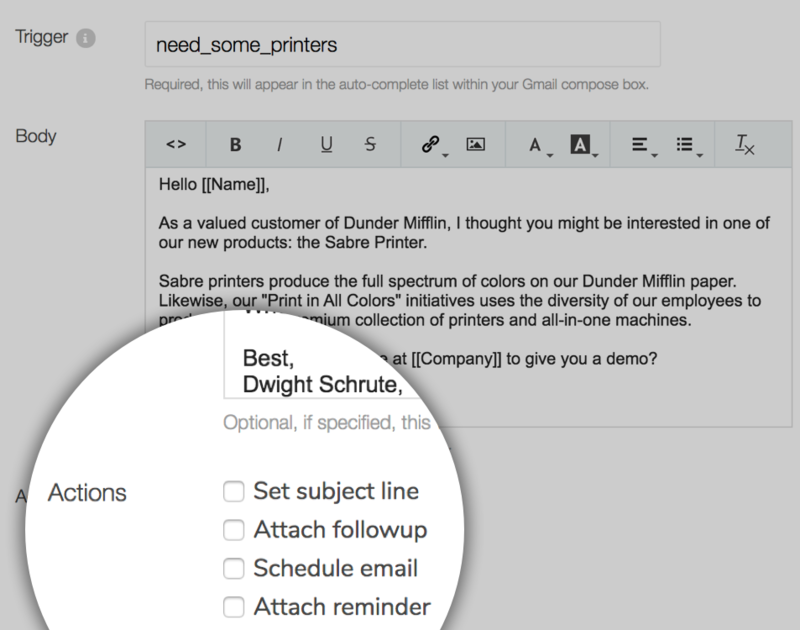 For example, a snippet can also set the subject line, schedule the email to be sent at a later time, or even associate the email with a followup sequence. See the "Actions" section of the New Snippet form. Any word surrounded by [[double brackets]] will be treated as a type-in placeholder. Vocus.io will prompt you to type in the values for the placeholders and will update the pasted text accordingly. This is a great way to quickly personalize that perfect blob of text. A snippet of text can be anything from normal unformatted text, to bullet points with links, to a well-formatted signature. You can also paste custom HTML elements with images or tables. Users part of the same team can selectively share snippets with their colleagues. That way you can all work from the best "gold" copy and collectively improve it.